(left to right:) Queen Elizabeth II, Queen Mary and the Delhi Durbar Necklace, given to Mary as tribute from the maharanis of India in 1911.
and so finally we’ve arrived at the Delhi Durbar Tiara, which for awhile was even filed under the “missing” category. Tiaras that were simply never seen and presumed gone…The tiara was a favorite of Mary’s, she wore it everywhere. It was then passed on to Queen Elizabeth (ex Duchess of York, future Queen Mum) who wore it all through the 1940s. 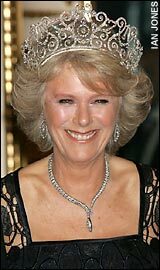 That was the last time the tiara was ever seen in public until the Duchess of Cornwall appeared in it at her “first tiara event” after marrying the Princess of Wales. I do not believe it has been seen since. The tiara takes the form of a tall circlet of lyres and S-scrolls, linked by festoons of rose and brilliant-cut diamonds. Geoffrey Munn eloquently describes it as “a graduated frieze of lyres and forget-me-not leaves and flowers, emblematic of harmony and love”. The upper border was originally set with ten of the Cambridge emeralds, acquired by Queen Mary in 1910 and originally owned by her grandmother the Duchess of Cambridge, but these were removed by 1922 and incorporated into a new tiara…yup, the Grand Duchess Vladimir tiara. Mary was the one who made the swap-out tear-drops. At your whimsy, madame, the original pearls of the Grand Duchess or the Cambridge Emeralds? 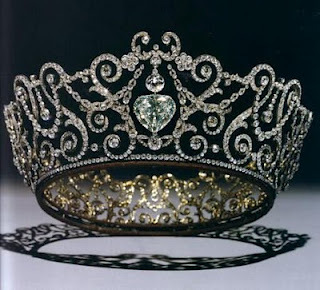 In the year following the Delhi Durbar, the tiara was altered to take either or both of the two Lesser Stars of Africa – Cullinan III and IV; the drop-shaped stone was held at the top of the jewel and the cushion-shaped stone hung in the oval aperture below. The Imperial Crown of India and the Delhi Durbar Tiara were only worn by George V and Mary for the Delhi Durbar ceremonies and coronation, after all the crowns were made specifically for said event. The Imperial Crown of India has not been used for any [soberano] since then. Similarly, the Delhi Durbar Tiara was not used by Queen Mary after 1911, although in 1947 she loaned it to her daughter-in-law, Queen Elizabeth, George VI’s wife, for an official state visit to South Africa. 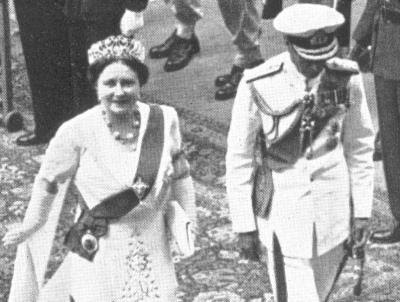 This was the second time the Delhi Durbar Tiara was worn by the Queen of England. What I cannot discern from the picture is if the tiara is in its present form (see bottom, no stone) or this third incarnation, to which I have yet to find an explanation. I think it’s the one below, but I’ve been wrong before. Upon Queen Mary’s death in 1953, the Cambridge Emerald Delhi Durbar Parure (all six pieces, tiara included!) was inherited by the Queen-Consort Elizabeth who gave the spread of gems to her daughter, the new Queen of England: Elizabeth II. Queen Elizabeth plays mix-and-match with the parure pieces and others in her collection, never having worn the entire parure as her grandmother or great-grandmother always intended. We’ve seen Elizabeth pictured recently wearing the Delhi Durbar necklace with the Girls of England and Ireland Tiara. As we’ve mentioned, the necklace is her favorite piece in the set; the Queen is often photographed in it. She often wears the earrings along with the Grand Duchess Vladimir Tiara, when its emerald mode, of course. She has never had the opportunity to wear the tiara. Not a single member of the Royal family had worn the tiara since 1947, so imagine the reaction (or confusion…it had been so long perhaps they’d forgotten it even existed) when it appeared for a third time in 2005. 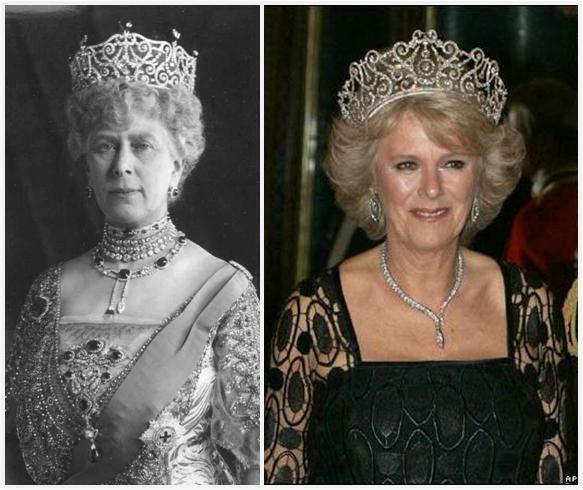 Camilla, the Duchess of Cornwall had the regal aura of the Delhi Durbar Tiara around her head at a state banquet in honor of the King and Queen of Norway. 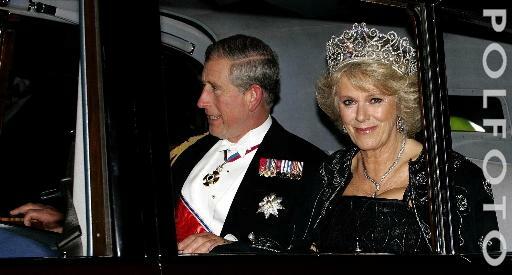 It was Camilla’s very first “tiara event” since marrying the Prince of Wales; the tiara loaned to her by her new mother-in-law for the occasion. 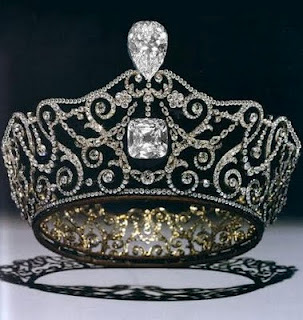 Suddenly, a tiara everyone assumed was lost forever (if they even knew it existed) was the center of attention after a lapse of nearly 60 years. Technically, the tiara was on display twice before this. Once in June of 1988, during an exhibition of royal jewels at Christie’s and once again in 2001 in a tiara exhibition at the Victoria and Albert Museum. This entry was posted in emerald, england, tiara time! 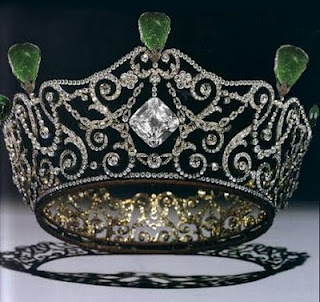 and tagged emerald, england, tiara. Bookmark the permalink.